At the exclusive beach club, you can find a grand pool with a swim up bar, ping-pong table, foosball table, playground, and volleyball court all within steps to the beach. This second floor condominium is part of a community that stands out as one of the most prestigious communities in the resort, a distinction that is not without significance given the impressive reputation of the resort. Nestled into the forest, high up on the hill, and overlooking the ocean and marina, the unparalleled colonial design of this community sets a tone of elegance and prestige. 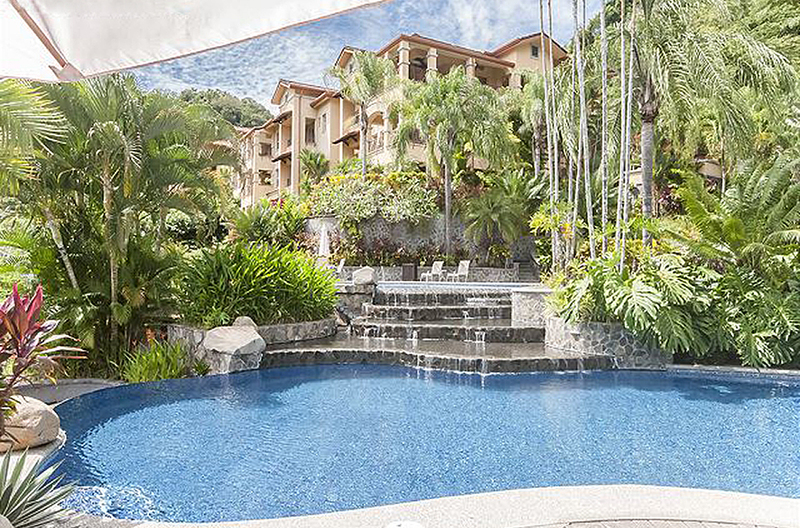 This gated community boasts a pre-Columbian influence, and the beautifully carved stonework arches and rushing waterfalls welcome guests as they enter the gates of this elegant community. This condominium features stunning ocean, marina and rainforest views, expansive terraces for entertaining and relaxation, and plenty of spacious living. Every condo is this community has three spacious bedrooms and 3 ½ bathrooms with a master bath jacuzzi. They also include an air conditioned fitness center, barbeque area, elevators, and golf cart parking. In addition to the grand pool at the beach club each community has its own pool. This condominium is just 90 minutes from the San Jose Airport. Additional Beds can be brought in for 2 additional guest. Our vacation was a dream come true! Our vacation was a dream come true. The resort and condo were extraordinary. The wonderful food and chef's preparations were fabulous. We all enjoyed the various excursions; and we are looking forward to future trips with Kosher Casas. Family of 8 from Texas.